Makita XPK01Z 18V LXT® LithiumIon Cordless 31/4 Planer, Tool Only. The Makita 18V LXT® Lithium-Ion Cordless Planer (model XPK01Z, tool only) combines the speed and capacity of a corded planer with the convenience of cordless. The result is fast and accurate stock removal, without the cord. The XPK01Z delivers 14,000 RPM and is engineered for fast stock removal. It will plane up to 3-1/4 wide and 5/64 deep in a single pass, with a 2-blade cutter head and double-edge carbide blades for added performance and a smooth finish. In addition, the precision machined aluminum base is engineered for increased planning accuracy. Comfort and ease-of-use features include a spring-loaded stand to elevate the base and protect the blades and work piece. The blade setting system is engineered for fast blade installation, with an electric brake for maximum productivity. The XPK01Z is engineered for door and window installers, finish carpenters, deck installers, remodelers, and general contractors seeking a best-in-class cordless planer. 2-blade cutter head with double edge carbide blades for added performance and smooth finish. High power-to-weight ratio; weighs only 7.4 lbs. With battery (battery not included). 14,000 RPM motor engineered for faster stock removal. Electric brake for maximum productivity. Equipped with Star Protection Computer Controls to protect against overloading, over-discharging and over-heating. Please contract us directly and provide your zip code and address type (commercial/residential). All corded products are designed to work with North American 110/120V outlets only. Merchandise that shows signs of installation. Merchandise in visibly used, or damaged condition. 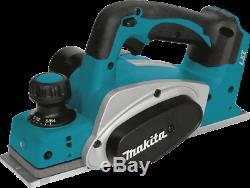 The item "Makita XPK01Z 18V LXT LithiumIon Cordless 31/4 Planer, Tool Only" is in sale since Monday, May 14, 2018. This item is in the category "Home & Garden\Tools\Power Tools\Planers". The seller is "prussia_sales" and is located in Dayton, New Jersey. This item can be shipped to United States, all countries in Europe, Canada, Mexico, Japan, Australia.